These three entries appeared separately in the original version of the Around Naples Encyclopedia on the dates indicated and have been consolidated here onto a single page. 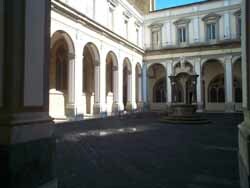 They are (1) the church of San Lorenzo Maggiore; (2) The archaeological site below the church; (3) the museum. San Lorenzo Maggiore was built in the great wave of Gothic church building in Naples, meaning, roughly, the 100 years between 1250 and 1350. The beginning of that period corresponds with the take-over of southern Italy by the French Angevin dynasty and the move of the capital of the kingdom from Palermo to Naples; thus, politics had at least as much to do with the presence of new, large churches in Naples as did the new architectural techniques that made such construction possible. Besides San Lorenzo, other major churches from that period include the Duomo, Donnaregina (new), Santa Chiara and San Domenico Maggiore. 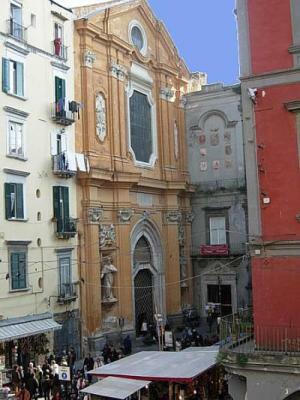 Of these, San Lorenzo is probably the least known to those who visit Naples. (Perhaps Donna Regina is less known, but only because it was closed for many years and has only recently reopened as a museum of religious art.) The church of San Lorenzo Maggiore is at the precise geographic center of the ancient Greco-Roman city (n.29 on this map), at the intersection of via San Gregorio Armeno and via dei Tribunali. Originally, the entire complex included an adjacent monastic complex, today a museum (item #3, below); thus, the term “San Lorenzo” may refer to the church, the museum or even the Roman archaeological site beneath the church itself (item #2, below). The origins of the church go back to the presence of the Franciscan order in Naples during the lifetime of St. Francis of Assisi, himself. The site of the present church was to compensate the order for the loss of their earlier church on the grounds where Charles I of Anjou decided to build his new fortress, the Maschio Angioino in the late 13th century. 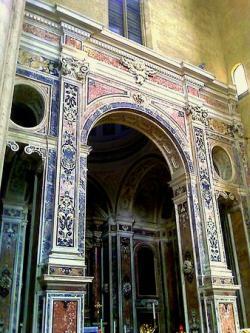 The church has been hit numerous times by natural disaster such as earthquakes and man-made interference such as overlays of later Spanish Baroque architecture, but that is equally true of almost every other medieval church in Naples. There have been attempts to “re-restore” parts of the church (the way they did with Santa Chiara when it was returned to its original Gothic bleakness in the 1950s after the church had been destroyed by a bomb in WWII). Thankfully, the “repristinators” have left later work by Cosimo Fanzago (the Cacace chapel) and Ferdinando Sanfelice (the facade) alone. Although some of the paintings originally within the church were moved to the Capodimonte museum, “immovable” works remain, including the main altar, considered one of the most beautiful in Naples; it was the work of Giovanni da Nola (Giovanni Merliano) (1488-1558), a prolific architect and sculptor who works still adorn many sites in Naples. Also present are a number of funerary monuments such as the tomb of Catherine of Austria (the daughter-in-law of Robert of Anjou); it is the first work in Naples by Tino da Camaino (1280-1337). Neapolitan political philosopher, Gaetano Filangieri (1752-88) said that much of the history of Naples came together in the church of San Lorenzo. Indeed, there are some interesting “comings-together.” For example, during Masaniello’s revolt (1547), the rebels captured the church and monastery and used the belfry as an artillery position. On a less belligerent note, students of Italian literature or even, generally, of European literature and culture may know that San Lorenzo is where Giovanni Boccaccio first set eyes on the love of his life, the lady Fiammetta (really Maria d’Aquino, the married daughter of King Robert the Wise of Anjou). It was during mass on the Saturday before Easter of 1334. He was thus inspired to write Elegia di Madonna Fiammetta, a novel in the form of a first person confessional monologue, often called the first "psychological novel" in Western literature. Excavations beneath the Church and Monastery of San Lorenzo have brought to light a complex and layered archeological history. About half of the original Roman market (photo, below) has been excavated and may be seen by entering through the marked portal next to the entrance to the church, itself, then passing through the courtyard and going down a flight of stairs. The site has been open since 1992 and is the result of 25 years of painstaking excavation. Also, as a result of the excavation, the great hall and three naves of a sixth century paleo-Christian church have been uncovered, and beneath the Sala Capitolare of the church a medieval structure has been found that apparently was one of the small "city halls" of the city. It was razed around the turn of the millennium and portions of it are built into the foundations of the newer church of San Lorenzo on top. It all rests on the original market place of the city (photo, right) from the fourth century before Christ. The market and streets were used as late as the fifth century AD, at which time they fell victim to a massive mud slide. The subsequent construction of the early Christian church on the site effectively closed them forever. They did it again: while I wasn't looking, another fine, small museum in Naples has opened. (The last one was the archaeological display at the Museo entrance to the new metropolitana train line.) This time, it's the turn of the church of San Lorenzo (photo, left), just off the intersection of via dei Tribunali and via San Gregorio Armeno (see #28 on this map), the precise geographical center of the historic Greco-Roman city of Naples, which area is on the UNESCO World Heritage List. The church, itself, sits directly atop the old Roman forum and market place; that site (item #2, above) was excavated and opened to the public in 1992 and, since then, has been one of the principal tourist attractions in the old city since it is the only large-scale excavated Roman site in the city. Entrance to that site is through the portal below the belfry of the church, across the main courtyard and down a flight of stairs. Now, as of December 2005, the "rest"—the new museum— is open to the public. The three floors above the courtyard are now given over to the entire history of the area that centers on San Lorenzo. The first floor of the new exhibit is dedicated to the archaeological site, itself; it includes a timetable of the excavation, recovered marble and ceramics from the old market, a table-top plastic model of the entire central area of the old city including the adjacent Temple of the Dioscuri (now the church of San Paolo Maggiore), and an historical description of the ancient city of Neapolis (from which the name "Naples" derives). As you then move up from floor to floor, you move forward in time, from Neapolis to a display of the historical shipping routes from Naples throughout Magna Grecia and the Roman Empire. That floor includes more recovered pottery, marble and mosaic. Above that is the history of post-Roman Naples at the site of San Lorenzo, first as a sixth-century paleo-Christian monastery, then as a medieval town-hall and then the large Franciscan monastery and church, the construction of which was begun in 1234. The display continues up past the Angevin period and into more recent history; it includes an exhibit of ecclesiastical paraphernalia on the top floor.